A petition signed by twenty prospective members residing in Washington, PA was presented to the Board of Management, Pennsylvania Society, at their meeting on June 5, 1924, requesting permission to organize a chapter of the Sons of the American Revolution (SAR), to be called the Washington Chapter, which was granted. This chapter was instituted with the following first officers: S. Murray Pollock, President; J. Winfield Reed, Vice President; James N. Doak, Secretary; Aaron K. Lyle, Treasurer; Boyd E. Warne, Registrar; C. L. McKee, Chaplain; and Harry M. Hall, Historian. 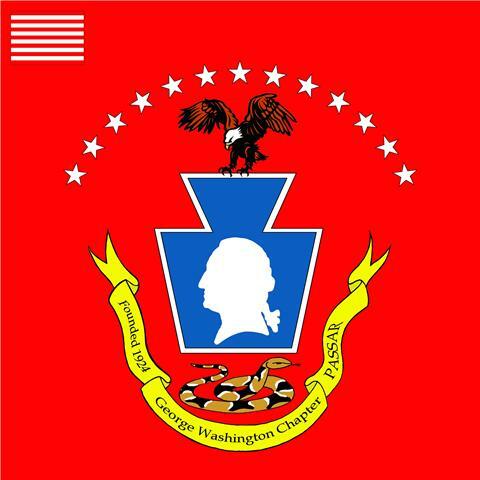 On April 17, 1927, the Board authorized a change in the name of the chapter to the George Washington Chapter, and this chapter is now the third oldest in the Pennsylvania Society. Washington County, PA, of which the City of Washington is the County Seat, was formed on March 28, 1781, the first Pennsylvania County formed after the Declaration of Independence and the only one organized during the Revolutionary period. It was probably the first, or one of the first localities, to be named in honor of George Washington, who as Commander-In-Chief of the Revolutionary forces, was at the height of his military fame.